Nicholas Hlobo’s concealment is revealed in this exhibition as the art of saying little and selling a lot. 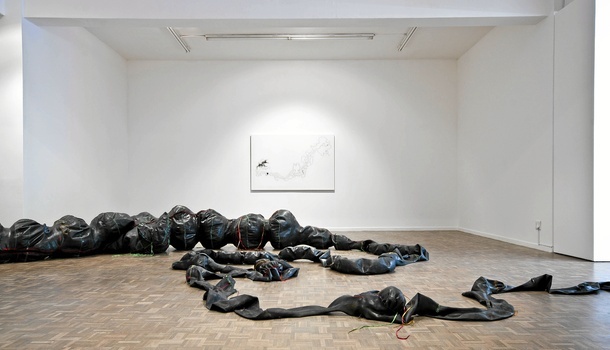 Whale of a work: Nicholas Hlobo’s Tyaphaka, made with the artist’s trademark rubber inner tubing and ribbon occupies much of the Stevenson gallery. For a while, I was worried that Nicholas Hlobo would become a black, gay, Xhosa artist — which, of course, he is. The artist, writer and curator Thembinkosi Goniwe has argued that when it comes to discussing the work of black artists, critics tend to use the artist’s biography as a primary point of departure, often to the detriment of the work itself. I have also argued that ­ethnicity and tutelage, or the lack thereof, have come to over-determine how we think of artists who are deemed rural and self-taught. Having said that, however, one has to acknowledge that when artists speak about their work, they make references to their life experience, their background, beliefs, whether political or religious, and self-identity. There exists the very real danger that the artists, no matter how they identify themselves, can thus be easily boxed. Hence my worry about Hlobo’s work, despite his valiant attempt not to make it uniformly easy for audiences and theorists. For one thing, he always gives his work titles in isiXhosa. The titles often refer, subtly, to body parts, cultural practices or sexual acts. Thus the act of thinking through Hlobo’s work involves prying apart the aesthetic, historical and conceptual from the biographical. In this way, Hlobo’s work operates both on visual and linguistic levels. It presents us with a problem. Not everyone is an isiXhosa speaker. So what is the intention, given that some titles are explained, but others are not? Even the ones that are explained often have double meanings or complex histories. How do we deal with a deliberate attempt at obfuscation? I am drawn to a conversation I had with Hlobo in 2008 in which we talked about access; who tells whose story and who has the licence to talk about whose culture? You know, the usual stuff. It is here that clues may lie to his artistic intention: that, for desire to work, something has to be denied, that a desire fulfilled is also a desire lost. Perhaps it is at this very intersection, where things are revealed and things are concealed — whether these things are linguistic or personal biographical details — that the mystery begins. That is, if one is to be positive about art that refuses to explain itself. Oblique references In a monograph on Hlobo, published to mark his receiving of the Standard Bank Young Artist Award for Visual Art in 2009, journalist and editor Mark Gevisser wrote convincingly about how pleasures or experiences denied inform Hlobo’s work. He made specific reference to the exhibition, that year, titled ­Umtshotsho. It was a show of sculpture that referenced the rituals that accompany the transition from youth to adulthood. In his artist’s statement, Hlobo noted that the term umtshotsho referred to a traditional party for young people. The event had evolved over time, now taking place in bars and clubs. But the title also made an oblique reference to the prohibitions that were visited upon the artist by conservatism and religion, related to traditional Xhosa rituals and to the erstwhile underground gay scene in Johannesburg. Thus it opened up the work to questions about tradition and masculinity. But something unsettles me about this conceptual game of hide-and-seek. I am reminded of a postcard I found in Morocco of a woman’s face, whose hand is delicately holding a veil that barely covers the face. So delicately that it looks like the sheer fabric might just slip from her fingers to reveal what is hidden. What surprised me about it is that contemporary Moroccans were peddling this clearly colonial Orientalist fantasy. Goniwe has also rightly argued that reading artworks necessarily involves pleasure. The pleasure of looking, of contemplating, of configuring meaning, and that to rush too quickly into burdening the process of appreciation with politics denies the artwork the very complexity that makes art potentially liberating. But hard questions need to be asked: At what point is the biographical handed to the viewer as something simply to consume, and to what degree is the visual merely a seduction that prevents one from being critical? Speaking as someone who has unabashedly admired Hlobo’s work for years, I find the overly admiring reviews and uncritical attention to his work worrying. Grotesque amphibian I also feel ambivalent when writing reviews of commercial shows. After all, it is not as though the curatorial aspect is going to be presented with a critical edge. Art in the commercial context hardly provides something one can sink one’s teeth into, something to rip apart. The show at the Stevenson, titled Tyaphaka and Other Works, consists of a sprawling monster lying on the floor. This I mistook for an overgrown mutant jellyfish or some kind of extraterrestrial amphibian. As it turns out, it is a beached whale — or something close enough — which was originally exhibited floating in Sydney Harbour. On the gallery walls, there are canvases that remind me a lot of the jars of tapeworms and hookworms procured from his patients that my father had in his surgical rooms as a form of decoration. The canvases are delicately rendered in ribbon and aluminium set against white backgrounds. The forms are shapely and seductive and, dare I say, pretty. There is nothing wrong with pretty, I suppose. Even the grotesque amphibian, titled Tyaphaka, has its moments. It is rendered in Hlobo’s trademark lacing of rubber inner tubing with ribbon. His technique lends the bland material a kind of nobility. But there is still something lacking. Or is it my imagination that is lacking? The sculptural canvases, delicately constructed, certainly look as though they could fit perfectly into any modern interior on lifestyle television show Top Billing. Meanwhile, the black behemoth that takes up most of the gallery floor could easily take pride of place in the vault of the more “serious” collector. So, on what grounds does one go about giving an opinion about a show that is clearly designed not to stir any feelings of doubt or upset? This art is not meant to question anything — it is just pretty and meant for consumption. And that is fine, just fine. What irritates is the constant desire to dress up the innocuous in critical discourse. It is not the artist’s fault that he has become a purveyor of a moribund culture. Even subversion manages only to ­titillate. Quite often, when contemplating whether any space remains for ­rigorous criticism, I find myself repeating Lauryn Hill, in her appropriation of the line by The Doors: “Come on baby, light my fire”.